, an eminent navigator, and justly thepride of his country in that character, was born at Marton in Cleveland, a village about four miles from Great Ayton, in the county of York, and was baptised there, as appears from the parish register, Nov. 3, 1728. His father, whose name was likewise James, was a day-labourer to Mr. Mewburn, a very respectable farmer, and lived in a small cottage, the walls chiefly of mud, as was generally the case at that time in the northern parts of the kingdom. In 1730, when our navigator was about two years old, his father removed with his family to Great Ayton, and was employed as a hind to the late Thomas Scottowe, esq. having the charge of a considerable farm in that neighbourhood known by the name of Airyholm. 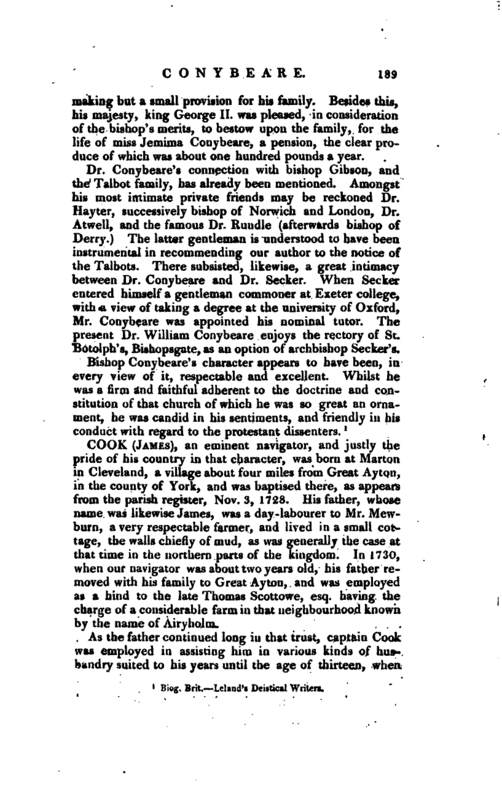 As the father continued long in that trust, captain Cook was employed in assisting him in various kinds of husbandry suited to his years until the age of thirteen, when | he was put under the care of Mr. Pullen, a schoolmaster, who taught at Ayton, where he learned arithmetic, bookkeeping, &c. and is said to have shewn a very early genius for figures. About January 1745, at the age of seventeen, his father bound him apprentice to William Saunderson for four years, to learn the grocery and haberdashery business, at Snaith, a populous fishing- town about ten miles from Whitby but after a year and half’s servitude, having contracted a very strong propensity to the sea (owing, probably, to the maritime situation of the place, and the great number of ships almost constantly passing and repassing within sight between London, Shields, and Sunderland), Mr. Sauuderson was willing to indulge him in following the bent of his inclination, and gave up his indentures. While he continued at Snaith, by Mr. Saunderson’s account, he discovered much solidity of judgment, and was remarkably quick in accounts. In July 1746 he was bound apprentice to Mr. J. Walker, of Whitby, for the term of three years, which time he served to his master’s full satisfaction. He first sailed on board the ship Freelove, burthen about 45O tons, chiefly employed in the coal trade from Newcastle to London. In May 1748, Mr. Walker ordered him home to assist in rigging and fitting for sea a fine new ship, named the Three Brothers, about 600 tons burthen. This was designed as a favour to him, as it would greatly contribute to his knowledge in his business. In this vessel he sailed from Whitby in the latter end of June. After two coal voyages, the ship was taken into the service of government, and sent as a transport to Middleburgh, to carry s.ome troops from thence to Dublin. When these were landed, another corps was taken on board, and brought over to Liverpool. From thence the ship proceeded to Deptford, where she was paid oft* in April 1749. The remaining part of the season the vessel was employed in the Norway trade. 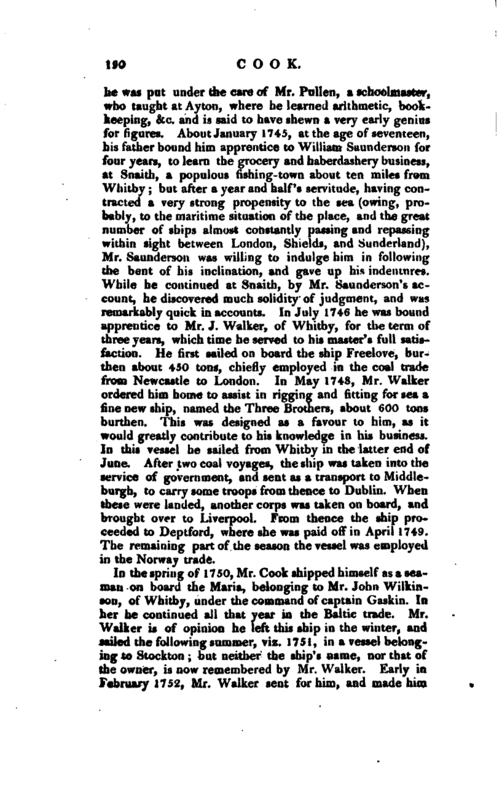 In the spring of 1750, Mr. Cook shipped himself as a seaman on board the Maria, belonging to Mr. John Wilkinson, of Wbitby, under the command of captain Gaskin. In her he continued all that year in the Baltic trade. Mr. Walker is of opinion he left this ship in the winter, and sailed the following summer, viz. 1751, in a vessel belonging to. Stockton; but neither the ship’s name, nor that of the owner, is now remembered by Mr. Walker. Early in February 1752, Mr. Walker sent for him, and made him | mate of one of his vessels, called the Friendship, about 400 tons burthen. In this station he continued till Ma,y or June 1753, in the coal trade. At that period Mr. Walker made him an offer to go commander of that ship; but he declined it, soon after left her at London, and entered on board his majesty’s ship Eagle, a frigate of 28 or 30 guns* “having a mind,” as he expressed himself to his master, to “try his fortune that way.” Not long after, he applied to Mr. Walker for a letter of recommendation to the captain of the frigate, which was readily granted. On the receipt of this he got some small preferment, which he gratefully acknowledged, and ever remembered. Some time after, the Eagle sailed with ^another frigate on a cruise, in which they were very successful. After this Mr. Walker heard no more of Mr. Cook until August 1758, when he received from him a letter dated Pembroke, before Louisburgb, July 30, 1758, in which he gave a distinct account of our success in that expedition, but does not say what station he then filled. He received a commission, as lieutenant, on the first day of April 1760; and soon after gave a specimen of those abilities which recommended him to the commands which he executed so highly to his credit, that his name will go down to posterity as one of the most skilful navigators which this country has produced. 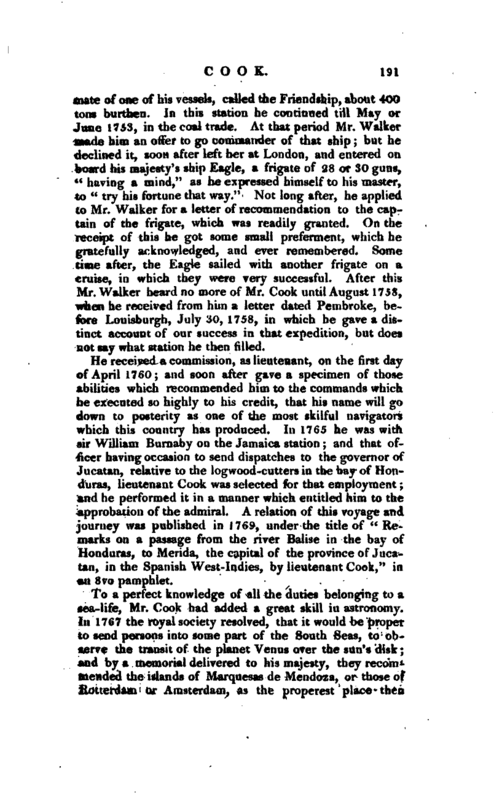 In 1765 he was with sir William B.urnaby on the Jamaica station; and that officer; having occasion to send dispatches to the governor of Jucatan, relative to the logwood-cutters in the bay of Honduras, lieutenant Cook was selected for that employment; and he performed it in a manner which entitled him to the approbation of the admiral. A relation of this voyage and journey was published in 1769, under the title of “Hemarks on a passage from tin? river Balise in the bay of Honduras, to Merida, the capital of the province of Jucatan, in the Spanish West.-Indies, by lieutenant Cook,” in an 8vo pamphlet. 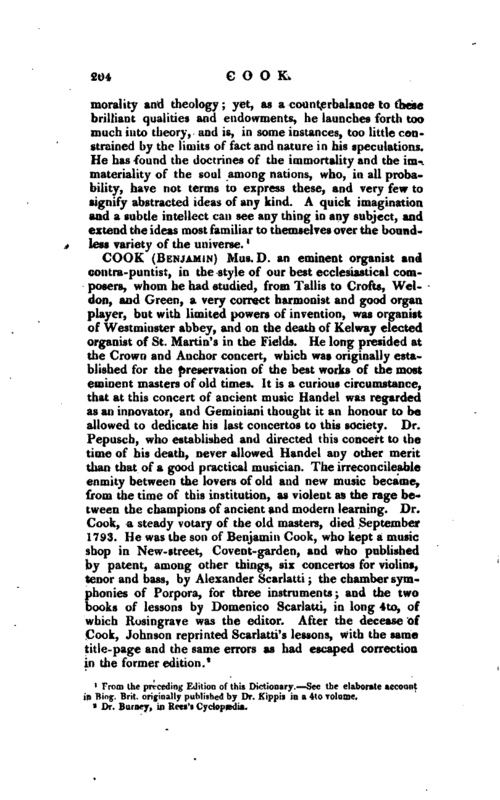 To a perfect knowledge of all the duties belonging to a sea-life, Mr. Cook had added a. great skill in astronomy, In 1767 the royal society resolved, that it would be proper to send persons into some part of the South Seas, to observe the transit of the planet Venus over the sun’s disk; and by a memorial delivered to his majesty, they recommended the islands of Marquesas de Mencloza, or those ofRotterdam or Amsterdam, as the properest place then | known for making such observation. To this memorial a favourable answer was returned; and the Endeavour, a ship built for the coal-trade, was put in commission, and the command of her given to lieutenant Cook. 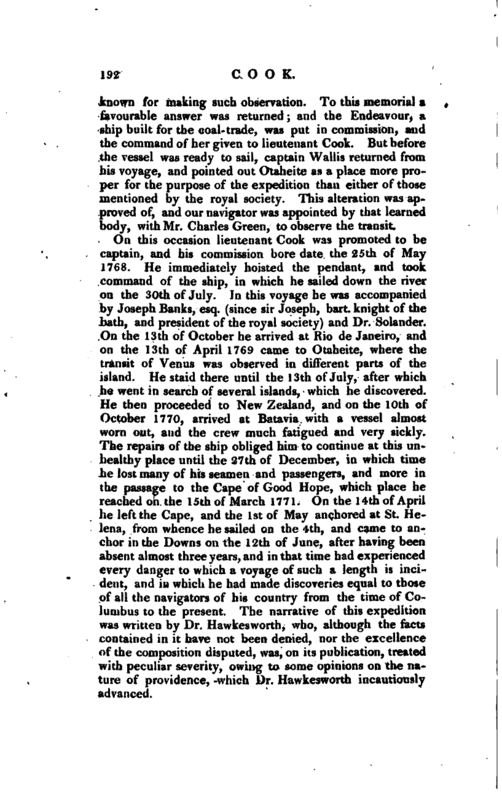 But before the vessel was ready to sail, captain Wallis returned from his voyage, and pointed out Otaheite as a place more proper for the purpose of the expedition than either of those mentioned by the royal society. This alteration was approved of, and our navigator was appointed by that learned body, with Mr. Charles Green, to observe the transit. 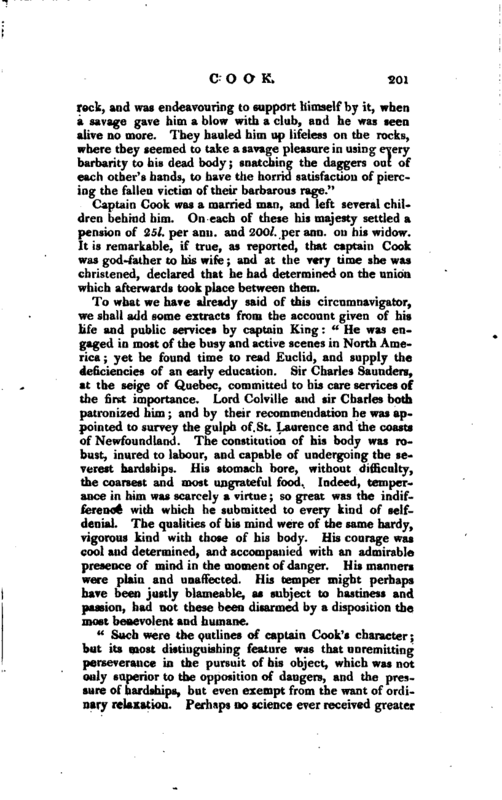 On this occasion lieutenant Cook was promoted to be captain, and his commission bore date the 25th of May 1768. He immediately hoisted the pendant, and took command of the ship, in which he sailed down the river on the 30th of July. In this voyage he was accompanied by Joseph Banks, esq. (since sir Joseph, bart. knight of the bath, and president of the royal society) and Dr. Solander. On the 13th of October he arrived at Rio de Janeiro, and on the 13th of April 1769 came to Otaheite, where the transit of Venus was observed in different parts of the island. He staid there until the 13th of July, after which he went in search of several islands, which he discovered. He then proceeded to New Zealand, and on the 10th of October 1770, arrived at Batavia with a vessel almost worn out, and the crew much fatigued and very sickly. The repairs of the ship obliged him to continue at this unhealthy place until the 27th of December, in which time he lost many of his seamen and passengers, and more in the passage to the Cape of Good Hope, which place he reached on the 15th of March 177-1. On the 14-th of April he left the Cape, and the 1st of May anchored at St. Helena, from whence he sailed on the 4th, and came to anchor in the Downs on the 12th of June, after having been absent almost three years, and in that time had experienced every danger to which a voyage of such a length is incident, and in which he had made discoveries equal to those of all the navigators of his country from the time of CoJumbus to the present. 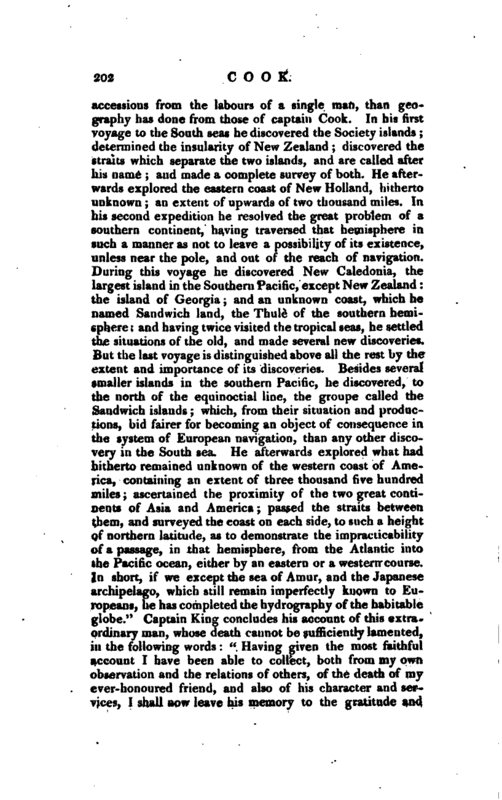 The narrative of this expedition was written by Dr. Hawkesworth, who, although the facts contained in it have not been denied, nor the excellence of the composition disputed, was, on its publication, treated with peculiar severity, owing to some opinions on the nature of providence, which Dr, Hawkesworth incautiously advanced, | Soon after captain Cook’s return to England, it was resolved to equip two ships to complete the discovery of the southern hemisphere. It had long been a prevailing idea, that the unexplored part contained another continent; and Alexander Dalrymple, esq. a gentleman of great skill and an enterprising spirit, had been very firmly persuaded of its existence. To ascertain the fact was the principal object of this expedition; and that nothing might be omitted that could tend to facilitate the enterprise, two ships were provided, furnished with every necessary which could promote the success of the undertaking. The first of these ships was called the Resolution, under the command of captain Cook; the other, the Adventure, commanded by captain Furneaux. Both of them sailed from Deptfortl on the 9th of April 1772, and arrived at the Cape of Good Hope on the 30th of October. They departed from thence on the 22d of November, and from that time until the 17th of January 1773, continued endeavouring to discover the continent, when they were obliged to relinquish the design, observing the whole sea covered with ice from the direction of S. E. round by the south to west. They then proceeded into the South Seas, and made many other discoveries, and returned to the Cape of Good Hope on the 2 1 st of March 1774, and from thence to England on the 14th of July; having during three years and eighteen days (in which time the voyage was performed) lost but one* man by sickness, in captain Cook’s ship; although he had navigated throughout all the climates from fifty-two degrees north to seventy-one degrees south, with a company of an hundred and eighteen men. 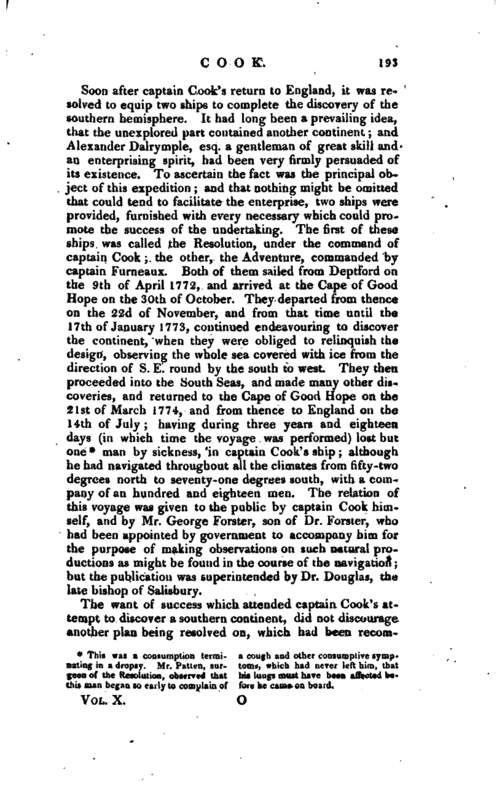 The relation of this voyage was given to the public by captain Cook himself, and by Mr. George Forster, son of Dr. Forster, who had been appointed by government to accompany him for the purpose of making observations on such natural productions as might be fouud in the course of the navigation; but the publication was superintended by Dr. Douglas, the late bishop of Salisbury. This was a consumption terminating in a dropsy. Mr. Patten, surgeon of the Resolution, observed that this man began so early to complain of a cough and other consumptive symptoms, which had never left him, that his lungs must have been affected before he came on board. | recommended some time before. This was no other than the finding out a north-west passage, which the fancy of some chimerical projectors had conceived to be a practicable scheme. The dangers which our navigator had twice braved and escaped from, would have exempted him from being solicited a third time to venture his person in unknown countries, amongst desert islands, inhospitable climates, and in the midst of savages; but, on his opinion being asked concerning the person who would be most proper to execute this design, he once more relinquished the quiet and comforts of domestic life, to engage in scenes of turbulence and confusion, of difficulty and danger. His intrepid spirit and inquisitive mind induced him again to offer his services; and they were accepted without hesitation. The manner in which he had deported himself on former occasions left no room to suppose a fitter man could be selected. He prepared for his departure with the utmost alacrity, and actually sailed in the month of July 1776. It will give pain to every sensible mind to reflect, that this honourable testimony to the merit of our gallant commander never came to his knowledge. While his friends were waiting with the most earnest solicitude for tidings concerning him, and the whole nation expressed an anxious impatience to be informed of his success, advice was received from captain Clerke*, in a letter dated at Kamtshatca, the 8th day of June 177.9; from which and from other accounts, we learnt, that captain Cook was killed oil the 14th of February 1779. 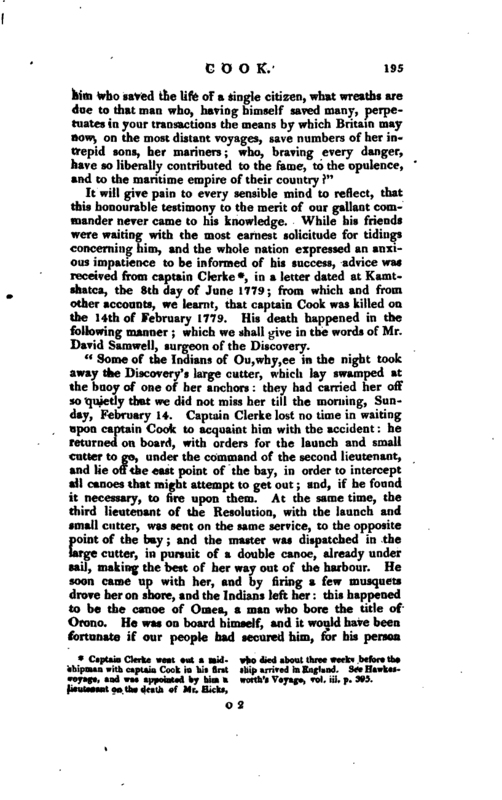 His death happened in the following manner; which we shall give in the words of Mr. David Samwell, surgeon of the Discovery. shipnaan with captain Cook in his first ship arrived in England. 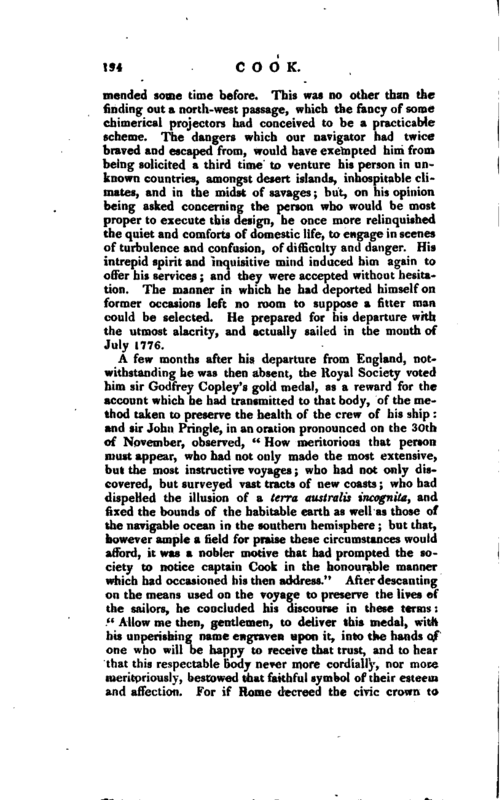 See Hawkesvoyage, and was appointed by him a worth’s Voyage, vol. iii. p. 395. lieutenant on the deaib of Mr. Hicks, | was held as sacred as that of the king. During this time captain Cook was preparing to go ashore himself at the town of Kavaroah, in order to secure the person of Kariopoo, before he should have time to withdraw himself to another part of the island out of our reach. This appeared the most effectual step that could be taken on the present occasion, for the recovery of the boat. It was the measure he had invariably pursued, in similar cases, at other islands in these seas, and it had always been attended with the desired success: in fact, it would be difficult to point out any other mode of proceeding on these emergencies, likely to attain the object in view. We had reason to suppose that the king and his attendants had fled wheu the alarm was first given: in that case, it was captain Cook’s intention to secure the large canoes which were hauled up on the beach. He left the ship about seven o’clock, attended by the lieutenant of marines, a serjeant, corporal, and seven private men: the pinnace’s crew were also armed, and under the command of Mr. Roberts. As they rowed towards the shore, captain Cook ordered the launch to leave her station at the west point of the bay, in order to assist his own boat. This is a circumstance worthy of notice; for it clearly shews, that he was not unapprehensive of meeting with resistance from the natives, or unmindful of the necessary preparation for the safety of himself and his people. I will venture to say, that from the appearance of things just at that time, there was not one, beside himself, who judged that such precaution was absolutely requisite: so little did his conduct on the occasion bear the marks of rashness or a precipitate self-confidence! He landed, with the marines, at the upper end of the town of Kavaroah: the Indians immediately flocked round, as usual, and shewed him the customary marks of respect, by prostrating themselves before him. There were no signs of hostilities, or much alarm among them. Captain Cook, however, did not seem willing to trust to appearances; but was particularly attentive to the disposition of the marines, and to have them kept clear of the crowd. He first inquired for the king’s sons, two youths who were much attached to him, and generally his companions on board. Messengers being sent for them, they soon came lo him; and informing him that their father was asleep, at a house not far -from them, he accompanied them thither, and took the marines along with them. As he passed | along, the natives every where prostrated themselves before him, and seemed to have lost no part of that respect they had always shewn to his person. He was joined by several chiefs, among whom was Kanynah, and his brother Koohowrooah. They kept the crowd in order, according to their usual custom; and being ignorant of his intention in coining on shore, frequently asked him, if he wanted any hogs, or other provisions: he told them, that he did not, and that his business was to see the king. When he arrived B.L the house, he ordered some of the Indians to go in and inform Kariopoo, that he waited without to speak with him. They came out two or three times, and instead of returning any answer from the king, presented some pieces of red cloth to him, which made captain Cook suspect that he was not in the house; he therefore desired the lieutenant of marines to go in. The lieutenant found the old man just awaked from sleep, and seemingly alarmed at the message; but he came out without hesitation. Captain Cook took him by the hand, and in a friendly manner asked him to go on board, to which he very readily consented. Thus far matters appeared in a favourable train, and the natives did not seem much alarmed or apprehensive of hostility on our side; at which captain Cook expressed himself a little surprisec), saying, that as the inhabitants of that town appeared innocent of stealing the cutter, he should not molest them, but that he must get the king on board. Kariopoo sat down before his door, and was surrounded by a great crowd: Kanynah and his brother were both very active in keeping order among them. In a little time, however, the Indians were observed arming themselves with long spears, clubs, and daggers, and putting on thick mats, which they use as armour. 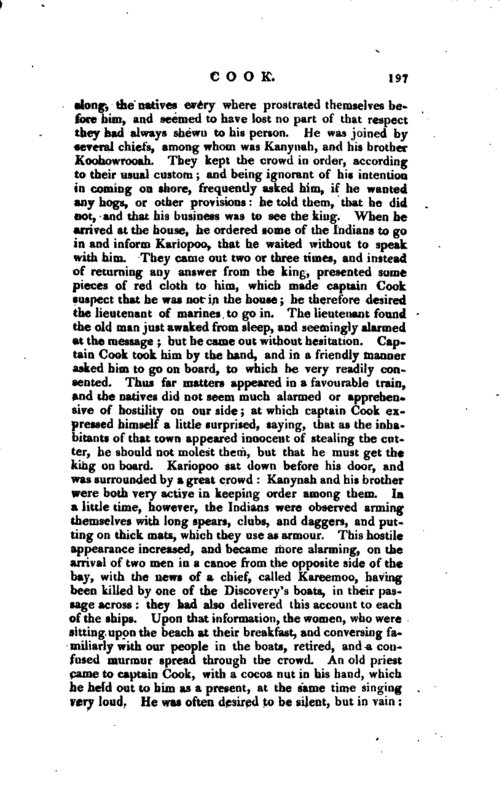 This hostile appearance increased, and became more alarming, on the arrival of two men in a canoe from the opposite side of the bay, with the news of a chief, called Kareemoo, having been killed by one of the Discovery’s boats, in their passage across: they had also delivered this account to each of the ships. Upon that information, the women, who were sitting upon the beach at their breakfast, and conversing familiarly with our people in the boats, retired, and a confused murmur spread through the crowd. An old priest came to captain Cook, with a cocoa nut in his hand, which he held out to him as a present, at the same time singing very loud. He was often desired to be silent, but in vain: | he continued importunate and troublesome, and there was no such thing as getting rid of him or his noise: it seemed as if he meant to divert their attention from his countrymen, who were growing more tumultuous, and arming themselves in every quarter. 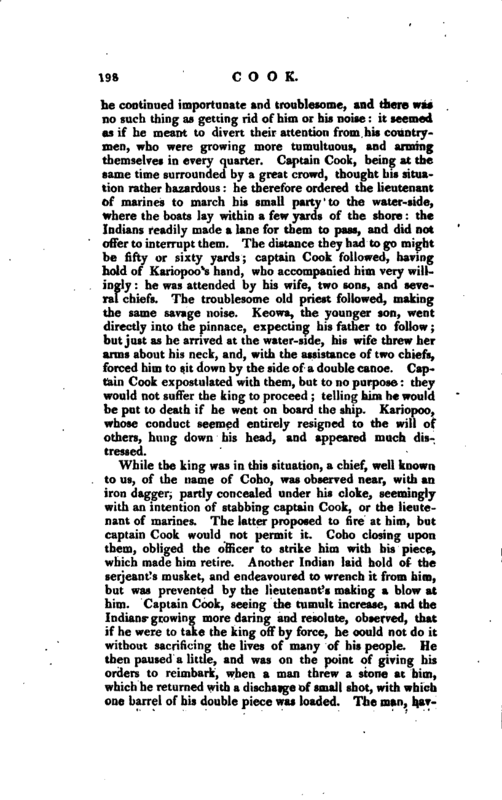 Captain Cook, being at the same time surrounded by a great crowd, thought his situation rather hazardous: he therefore ordered the lieutenant of marines to march his small party to the water-side, where the boats lay within a few yards of the shore: the Indians readily made a lane for them to pass, and did not offer to interrupt them. The distance they had to go might be fifty or sixty yards; captain Cook followed, having hold of Kariopoo’s hand, who accompanied him very willingly: he was attended by his wife, two sons, and several chiefs. The troublesome old priest followed, making the same savage noise. Keowa, the younger son, went directly into the pinnace, expecting his father to follow; but just as he arrived at the water-side, his wife threw her arms about his neck, and, with the assistance of two chiefs, forced him to sit down by the side of a double canoe. Captain Cook expostulated with them, but to nopurpose they would not suffer the king to proceed telling him he would be put to death if he went on board the ship. Kariopoo, whose conduct seemed entirely resigned to the will of others, hung down his head, and appeared much distressed. While the king was in this situation, a chief, well known to us, of the name of Coho, was observed near, with au iron dagger, partly concealed under his cloke, seemingly with an intention of stabbing captain Cook, or the lieutenant of marines. The latter proposed to fire at him, but captain Cook would notpermit it. Coho closing upon them, obliged the officer to strike him with his piece, which made him retire. Another Indian laid hold of the Serjeant’s musket, and endeavoured to wrench it from him, but was prevented by the lieutenant’s making a blow at him. Captain Cook, seeing the tumult increase, and the Indians growing more daring and resolute, observed, that if he were to take the king off by force, he could not do it without sacrificing the lives of many of his people. He then paused a little, and was on the point of giving his orders to reimbark, when a man threw a stone at him, which he returned with a discharge of small shot, with which one barrel of his double piece was loaded. The man, hay* | ing a thick mat before him, received little or no hurt: he brandished his spear, and threatened to dart it at captain Cook, who being still unwilling to take away his life, instead of firing with ball, knocked him down with his musket. He expostulated strongly with the most forward of the crowd, upon their turbulent behaviour. He had given up all thoughts of getting the king on board, as it appeared impracticable; and his care was then only to act on the defensive, and to secure a safe embarkation for his small party, which was closely pressed by a body of several thousand people. 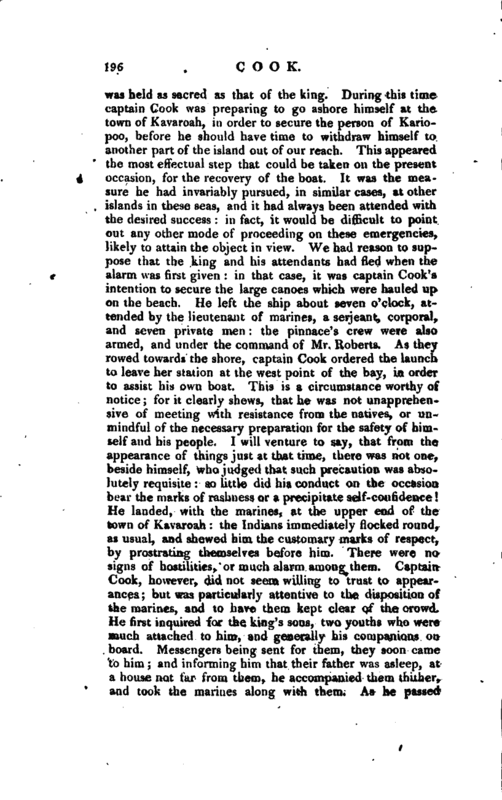 Keowa, the king’s son, who was in the pinnace, being alarmed on hearing the first firing, was, at his own entreaty, put on shore again; for even at that time Mr. Roberts, who commanded her, did not apprehend that captain Cook’s person was in any danger, otherwise he would have detained the prince, which no doubt would have been a great check on the Indians. 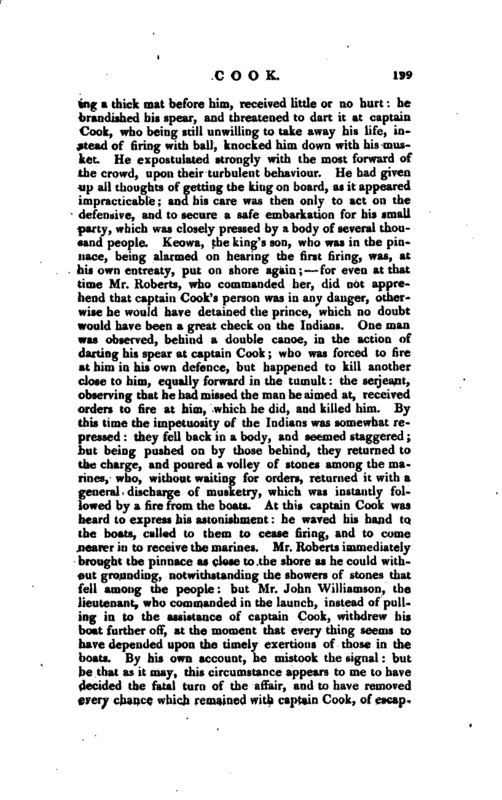 One man was observed, behind a double canoe, in the action of darting his spear at captain Cook; who was forced to fire at him in his own defence, but happened to kill another close to him, equally forward in the tumult: the serjeant, observing that he had missed the man he aimed at, received orders to fire at him, which he did, and killed him. By this time the impetuosity of the Indians was somewhat repressed: they fell back in a body, and seemed staggered; but being pushed on by those behind, they returned to the charge, and poured a volley of stones among the marines, who, without waiting for orders, returned it with a general discharge of musketry, which was instantly followed by a fire from the boats. At this captain Cook was heard to express his astonishment: he waved his hand to the boats, called to them to cease firing, and to come nearer in to receive the marines. Mr. Roberts immediate^ brought the pinnace as close to the shore as he could without grounding, notwithstanding the showers of stones that fell among the people: but Mr. John Williamson, the lieutenant, who commanded in the launch, instead of pulling in to the assistance of captain Cook, withdrew his boat further off, at the moment that every thing seems to have depended upon the timely exertions of those in the boats. By his own account, he mistook the signal: but be that as it may, this circumstance appears to me to have decided the fatal turn of the affair, and to have removed every chance which remained with captain Cook, of escap* | ing with his life. The business of saving the marines out of the water, in consequence of that, fell altogether upon the pinnace; which thereby became so much crowded, that the crew were in a great measure prevented from using their fire-arms, or giving what assistance they otherwise might have done to captain Cook; so that he seems, at the most critical point of time, to have wanted the assistance of both boats, owing to the removal of the launch. 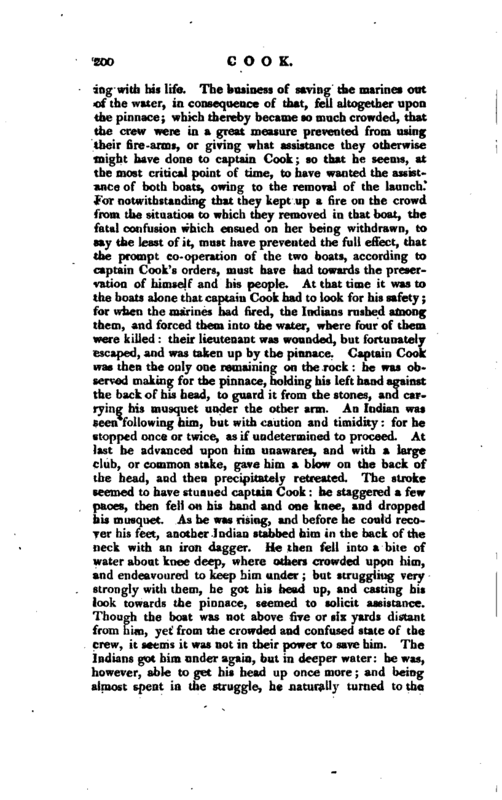 For notwithstanding that they kept up a fire on the crowd from the situation to which they removed in that boat, the fatal confusion which ensued on her being withdrawn, to say the least of it, must have prevented the full effect, that the prompt co-operation of the two boats, according to captain Cook’s orders, must have had towards the preservation of himself and his people. At that time it was to the boats alone that captain Cook had to look for his safety; for when the marines had fired, the Indians rushed among them, and forced them into the water, where four of them were killed: their lieutenant was wounded, but fortunately escaped, and was taken up by the pinnace. Captain Cook was then the only one remaining on the rock: he was observed making for the pinnace, holding his left hand against the back of his head, to guard it from the stones, and carrying his musquet under the other arm. An Indian was seen following him, but with caution and timidity: for he stopped once or twice, as if undetermined to proceed. At last he advanced upon him unawares, and with a large club, or common stake, gave him a blow on the back of the head, and then precipitately retreated. The stroke seemed to have stunned captain Cook: he staggered a few paces, then fell on his hand and one knee, and dropped his musquet. As he was rising, and before he could recover his feet, another Indian stabbed him in the back of the neck with an iron dagger. He then fell into a bite of water about knee deep, where others crowded upon him, and endeavoured to keep him under; but struggling very strongly with them, he got his head up, and casting his look towards the pinnace, seemed to solicit assistance. Though the boat was not above five or six yards distant from him, yet from the crowded and confused state of the crew, it seems it was not in their power to save him. The Indians got him under again, but in deeper water: he was, however, able to get his head up once more; and being almost spent in the struggle, he naturally turned to the | rock, and was endeavouring to support himself by it, when a savage gave him a blow with a club, and he was seen alive no more. They hauled him up lifeless on the rocks, where they seemed to take a savage pleasure in using every barbarity to his dead body; snatching the daggers out of each other’s hands, to have the horrid satisfaction of piercing the fallen victim of their barbarous rage." Captain Cook was a married man, and left several children behind him. On each of these his majesty settled a pension of 251. per ann. and 200l. per ann. on his widow. It is remarkable, if true, as reported, that captain Cook was god-father to his wife; and at the very time she was christened, declared that he had determined on the uniou which afterwards took place between them. 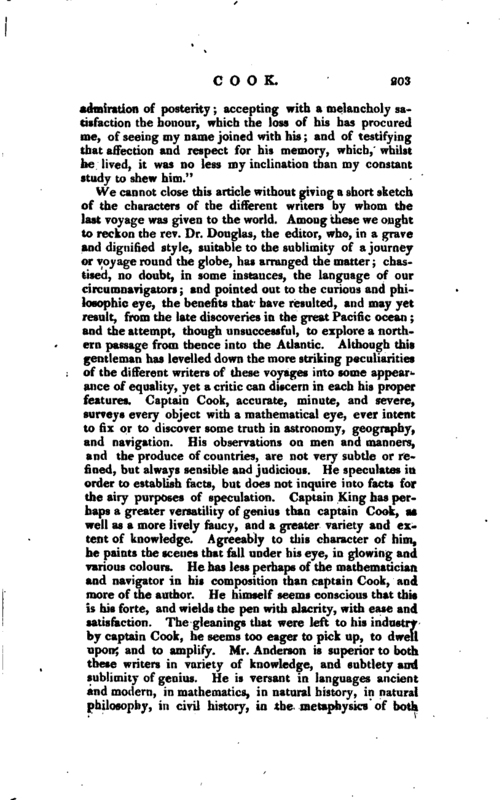 To what we have already said of this circumnavigator, we shall add some extracts from the account given of his life and public services by captain King: " He was engaged in most of the busy and active scenes in North America; yet he found time to read Euclid, and supply the deficiencies of an early education. Sir Charles Saunders, at the seige of Quebec, committed to his care services of the first importance. Lord Colville and sir Charles both patronized him; and by their recommendation he was appointed to survey the gulph of St. Laurence and the coasts of Newfoundland. The constitution of his body was robust, inured to labour, and capable of undergoing the severest hardships. His stomach bore, without difficulty, the coarsest and most ungrateful food. Indeed, temperance in him was scarcely a virtue; so great was the indifference with which he submitted to every kind of selfdenial. The qualities of his mind were of the same hardy, vigorous kind with those of his body. His courage was cool and determined, and accompanied with an admirable presence of mind in the moment of danger. His manners were plain and unaffected. His temper might perhaps have been justly blameable, as subject to hastiness and passion, had not these been disarmed by a disposition the most benevolent and humane. From the preceding Edition of this Dictionary.—See the elaborate account in Biog. Brit, originally published by Dr. Kippis in a 4to volume.